‘We only want one room!’ Will your summer holiday experiences create the right memories? As the UK basks in glorious sunshine, many of us have already got into the summer holiday spirit. With the school holidays here or about to commence, suntan lotion is being stocked up, new bikinis and swimming costumes being purchased, and plenty of reading material is being downloaded onto Kindles. Whilst it is impossible to predict the weather for a British summer, it is possible to predict that families from all over the UK will be embarking on their summer holidays in the next few weeks. Some will choose to stay at home (something we have done before very successfully). Some will choose to holiday within the British Isles (and with weather like this, who can blame them). Others will take the more adventurous route and board planes, trains and boats to different parts of the world. It is all very exciting – especially if you are a little person. If you think back to your holidays as a child, there are likely to be a lot of very happy memories. Like all great experiences, it is the best ones that you remember, and holidays rank right up there amongst the most memorable of all experiences we have. I will never forget the time I was lucky enough to be taken to Disneyland in California. I remember boarding the bus to go back to the car at 2am – it was the first time I had ever stayed up so late – I remember it so vividly. It was an amazing experience. Holidays should be great experiences – not just for the children, but for everyone – from the youngest to the oldest. The holiday experience should be a great experience from beginning to end – from the minute you start to investigate where to go, to the minute you return home to start doing the washing!! Ok – it will never be a great experience once you get to the washing part, but there are some ‘moments of truth’ in every customer journey that cannot be avoided (unless you can afford to have a maid that is!!). In reality, holidays are not always great ‘end to end’, and that is the reason for writing this blog post. We have all had experiences of accommodation that was ‘not quite what we expected’. I’ll never forget the ‘luxury’ cottage B&B in the UK that ended up being a ‘hell hole’. When we entered the room, all we could hear was buzzing. The room was full of flies – we could not even stay the night! We all also have plenty of horror stories of the travelling ‘steps’ of the journey – from being stranded in airports, to uncomfortable flights, to not realising that the low-cost Ryanair flight planted us miles away from the centre of the city! However, I do not want to focus on the usual ‘holiday nightmares’ – I want to focus on the bit right at the beginning. The bit that is usually done by Mrs Golding (thankfully). The bit that is becoming more and more stressful. Booking your holiday should actually be quite exciting. Dates have been agreed, location decided upon – you can start dreaming of white sandy beaches and wonderful food that makes the pre holiday dieting worthwhile. So choosing the hotel, villa, resort, mode of transport etc.. shouldn’t be too hard….should it? When I first met my beautiful wife Naomi, it certainly was not difficult. As a couple, we could wait until the very last second to book a holiday. On one occasion, we opted for the ‘find out where you are staying when you get there’ option – it was so easy and fun. Yes it was a lottery, but it added to the mystique. We could travel at any time of the year. When Ciara came along (our eldest daughter), things were a little more tricky, but still not too challenging. We had different requirements, needing our chosen destination to be ‘baby friendly’, but there were plenty of options. Even when Caitie arrived (daughter number two), we were still able to affordably identify suitable holiday options. Most hotels were designed for 2+2 – families with two children. So although travelling with young children was more complicated, a family of four can very easily find somewhere to stay. Then little Jack came along. Our only son, like our two daughters, was an amazing addition to our family. Funny, witty, with a smile that can turn even the grumpiest Dad to mush, Jack does not realise what trouble he has caused. Jack turned our family from 2+2 to 2+3. Jack has made booking a holiday a complete nightmare. For the last six years, we (I say we, but I mean mostly Naomi) have increasingly struggled to find accommodation that will accept our little clan in one room. I have at times observed Naomi tearing her hair out! Unless you have three children or more, it might be difficult to understand, but why oh why is it such a challenge for the tourism industry to accommodate families of 5 or more ‘economically? All the way back in 2001, the Guardian published an article about the rise of families with three children (http://www.guardian.co.uk/lifeandstyle/2001/apr/04/familyandrelationships.features102). The author, Sarah Ebner, reported that even though the average birth rate was falling, and the number of lone parents increasing, more of the children being born at the time were the third in their family. Families with three or more children are not a new concept. One-child families have increased by 5 per cent over the last 16 years to 47 per cent, while families with three or more children fell by 3 per cent to 14 per cent, the Office for National Statistics (ONS) survey of 100,000 families found. Whilst one child families are increasing, there are still 14% of families in the UK who have three or more children. The European average is 11%, whilst the Netherlands have the greatest percentage at 19%. That is a lot of families who need accommodation that is not 2+2! So why is it so difficult to find a holiday to accommodate the millions of families who fit into the ‘large family bracket’? I do understand that there are options. We could go camping. It is completely up to us how many people we want to fit in a tent! We could rent a villa – something we often do – and mainly because it is the easiest way to find accommodation for a family of five. But there are times when we want more than a tent in a field, or a villa can provide. Sometimes we want a holiday where someone else makes the beds and cleans the bathroom. Where someone else cooks the meals and provides the entertainment. A holiday where everyone gets a rest – not just the kids. We want these simple luxuries to be affordable. That is why it irritates me so much when hotels will only accommodate us in two separate rooms! This is now going to sound like a rant – I suppose it is, but when you are faced with having to pay inflated summer holiday prices, you do not want to have to pay double!! I do not understand why it is possible for smaller establishments (such as B&Bs) to accommodate as many people as they want in a room, when hotels militantly demand that no more than four people can stay in one room. An old colleague suggested to me that it is clearly a health and safety issue……I am not sure I agree. No one has ever made it clear as to why hotels do not allow more than four people to stay in one room. At a time when families are struggling with less disposable income, we need/demand easier, more affordable experiences. Is it not enough that there is nothing to stop hotels and travel operators from charging families more during the summer holidays? Not only do I not want to have to pay for two rooms, I do not want to be split up from half of the family every night either. Why do we want to go on holiday to spend the holiday in separate places?! Families with three or more children face this battle on an annual basis. They have been for many years. I found this interesting conversation in a forum on Martin Lewis’s website (http://forums.moneysavingexpert.com/showthread.php?t=993159&page=1) – it is a fascinating insight that helps contextualise the problem. 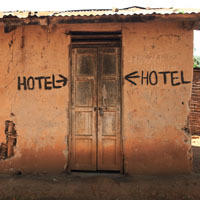 If only hotel owners could put their customers first and think about the challenge from our perspective. If only they could consider larger families when designing new hotels. Wouldn’t it be cool if hotels were designed as flexible spaces – where rooms could have moveable walls that could be made bigger or smaller depending on the guests requirements. Now that would be something. The holiday experience should be memorable for the right reasons. So if you are reading this on your tablet whilst sipping a Pina Colada on a sunbed in Barbados, just spare a thought for the mum or dad who is still trying to find suitable affordable accommodation (that is not a tent) for their family this summer! By the way, if you do not the ‘official’ reason why hotels will not allow more than four people in one room, I would love to know what it is! !